Some eyebrows were raised when Pokerstars announced its schedule for the 2008 WCOOP (World Championship of Online Poker). Some thought that the $30 million dollars in guarantees were a bit ambitious, even for a poker room the size of Pokerstars. So far, so good for Pokerstars. They haven't had anything close to an overlay after eight events of this year's WCOOP. Of the eight WCOOP events that have been played so far, five have had a total prize pool that was 50% larger than what Pokerstars had guaranteed. Two of the events (WCOOP #1 and WCOOP #4) had a prize pool that was 40% larger than the guarantee, while WCOOP #6 (the NLHE 3M Guaranteed tournament) had a prize pool that was 22.5% larger than what Pokerstars had guaranteed. It's still early, but this is obviously an encouraging sign for Pokerstars, and a testament to their continuing rapid growth. 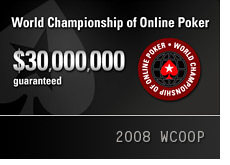 Pokerstars' decision to only hold the WCOOP once every year seems to have paid off. Nothing comes close to matching the size and prestige of the WCOOP. Full Tilt Poker has a different philosophy - they choose to run their FTOPS every couple of months. Many players are certainly happy to have a series of tournaments with guaranteed money every couple of months -however the strategy started to show some cracks during FTOPS IX. Of the 25 events that were played, eight had an overlay. This included the main event and a couple of other tournaments with 1M+ in guaranteed prize money. Sure, these tournaments were still extremely well-attended, but the eight overlays certainly didn't help to build up the prestige of the tournament. When it comes to the "buzz" factor, the WCOOP wins hands-down. Many professional players will book time off specifically to play in WCOOP events - I don't think that you can say the same about Full Tilt's FTOPS events. Some people have taken Pokerstars to task for only holding the WCOOP once every year - however, with a prize pool that is very likely to top $40 million dollars this year, you certainly can't fault them for it.